Weekends in Gibraltar up to -70% off To take advantage of these offers, join now for free! Known as the Key to the Mediterranean, Gibraltar, an overseas British territory, is linked with mainland Spain by a narrow isthmus. Close to the southern tip of the Iberian peninsula, the Rock of Gibraltar rises out of the sea at Algeciras Bay. Search Voyage Prive today for exclusive weekend breaks. 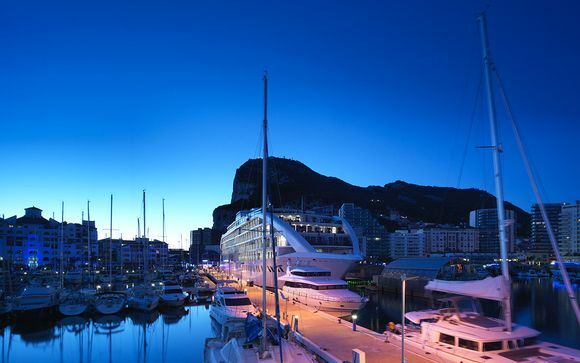 We can help you with luxury weekend breaks to Gibraltar where your dream trip won’t break the bank. Have the time of your life in Gib whether it’s diving, fishing, sailing or climbing the Rock. Chill out on one of Gibraltar’s six idyllic beaches, then head into town for some retail therapy. Buy duty-free bargains from major retail stores, most of which are located on Main Street. Be enthralled by the Barbary apes which run wild on the upper Rock. For something a little different, take a guided tour of St Michael’s Cave which has tunnels filled with startling stalactites of all shapes and sizes. Stay in one of our handpicked, luxurious hotels which we have especially selected for you. To make the most of your weekend break to Gibraltar, take advantage of our exclusive prices and exceptional discounts. Many hotels provide outdoor as well as indoor sports including other activities. Discover where to stay on Gib and immerse yourself in the relaxing atmosphere for a weekend away with a loved one, friends or family. Our last-minute Gibraltar deals allow you to budget to go out, wine, dine and dance the night away. Gibraltar boasts a fantastic selection of restaurants, wine bars and traditional British pubs. From juicy steaks to creamy pastas, fresh seafood to classic lamb shanks, there’s mouth-watering food for everyone. After a delicious meal, visit a Karaoke bar before hitting the nightspots such as the Dust Night Club that plays house and dance music. The next day, don’t miss out on visiting Gib’s many attractions. At the most southern tip of the peninsula is Europa Point. This historic 19th century lighthouse is well worth a visit. From here you can see the old chapel of Nuestra Senora de Europa, the Harding Battery, a restored fortification built in 1859 and Nun’s Well, an ancient underground reservoir. Gibraltar is truly a special Mediterranean destination. During your weekend break here, learn more about Gibraltar’s unique history at the Gibraltar Museum. Drive, climb, hike or take a leisurely cable car ride to the top of the Rock which offers spectacular views. This seven sq km peninsula bordered in the north by Andalusia has so much to see and do for such a small destination. From carnivals to events and an international mix of culture, Gibraltar has it all. Why not sign up to our site in order to browse all available offers and be alerted to upcoming Gibraltar weekend breaks.